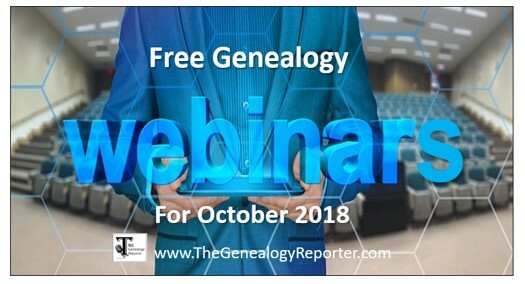 We have your list of free genealogy webinars for October 2018 and they are among the best we’ve seen all year! A special series of free webinars sponsored by the Board for Certification of Genealogists, strategies for finding birth families, and researching French records is just a hint of what’s in store. Not sure what a webinar even is? Click here to learn the details, then return back to this page to see all the top-notch webinars available for the month of October! 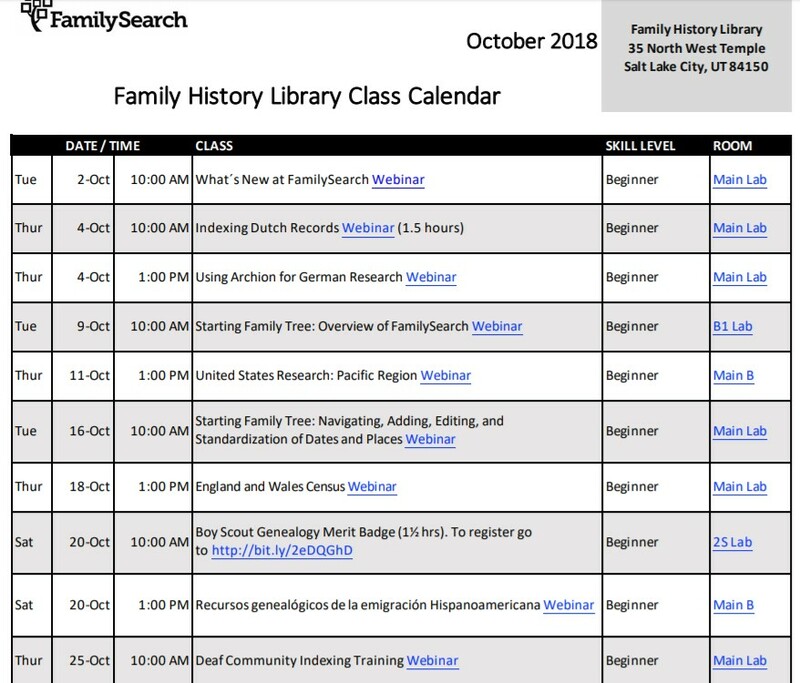 A full day of free presentations live at the Family History Library and online at Family Tree Webinars is set for October 19, 2018. 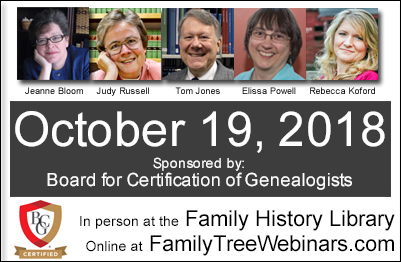 Learn from leading certified genealogists in the field, Jeanne Bloom, Judy Russell, Tom Jones, Elissa Powell, and Rebecca Koford. This event is being sponsored by the Board for Certification of Genealogists. 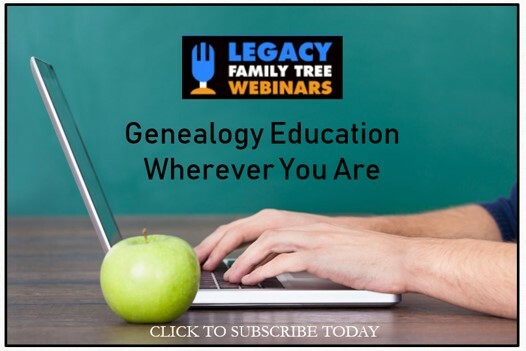 Legacy Family Tree Webinars also has free content each month. Though it is a subscription site, they offer free webinars several times a week to the public. If you miss a live webinar, you have a week to view it for free. Here’s a glance at a few of the upcoming, free genealogy webinars coming up at Legacy Family Tree Webinars. Click on the titles below to see a description and register for free. Free genealogy webinars are being offered from state genealogical societies, too. Be sure to check your own state society to see what is offered. Here is a short list of some of the webinars you might be interested in for the month of October. You do not need to be a member of these societies to enjoy the live webinar. Click on the hyperlinked society’s name and you will be directed to a page to register for the upcoming webinars. 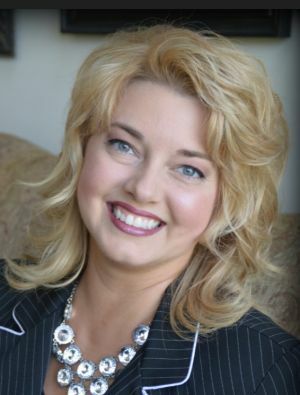 “The GPS, Document Analysis, and Citations, Oh My!,” presented by Sara Gredler, MS, Saturday, October 6th, 10 AM Pacific Time – This presentation discusses the Genealogical Proof Standard, document analysis and evaluation, and citation standards, and how to make them second nature in our genealogical research. “The YDNA Test Should be Your Favorite,” presented by Diahan Southard on Wednesday, October 17th, 6 PM Pacific Time –The Y chromosome DNA, with its direct paternal line inheritance pattern, is a powerful tool for any genealogist, male or female, seeking to extend or verify a genealogical line. This lecture will cover basic and intermediate principles of using YDNA verify and extend your pedigree chart. “Chicago Rises from the Ashes: The Columbian Exposition Gives Perspective to the Family Historian,” presented by Jean Wilcox Hibben, October 9th, 8 PM Central Time. “Unpuzzling the Past: Tips and Techniques for French Records,” presented by Bryna O’Sullivan, October 16th, 7 PM Central Time – What do you do when you want to research your French-Canadian ancestors – and don’t speak or read French? This presenation will cover techniques for working through French language records, including typical formats, when to use a word list or dictionary, and when to spend the money on a translator. “The Anatomy of BMD: What You Don’t Know About Vital Records,” presented by Gena Philibert-Ortega, October 18th, 8 PM Eastern Standard Time – Everyone knows about vital records, right? This presentation looks at the history of vital records in the United States, variations of those records, and alternatives. “Full Circle,” presented by Nicka Smith, October 24th, 8 PM Eastern Standard Time – Descendants of former slaveholders come from all walks of life. DNA and renewed interest in family history research continue to unearth this phenomena for thousands of people every day. In this session, learn how to confirm slave-holding ancestors and the tools needed to trace and identify living descendants of their formerly enslaved.